The Massachusetts Employer Survey is critical to the Massachusetts Center for Health Information and Analysis's (CHIA) mission of monitoring the Massachusetts health care and health insurance systems, and providing reliable information and meaningful analysis for those seeking to improve health care quality, affordability, access, and outcomes. JSI and our collaborators at the National Opinion Research Center (NORC) at the University of Chicago have been contracted by the Center to assist the agency with the redesign and implementation of the Massachusetts Employer Survey. JSI and NORC are ideally suited to carry out this project because of their in-depth understanding of the Massachusetts health insurance market, their experience in designing and conducting multiple employer health insurance surveys at the state and national levels and successful track record of drafting high quality data reports to inform state policy making. The survey provides a unique lens on changes in Massachusetts health insurance markets in both pre- and post-reform periods, including the more recent implementation of the Affordable Care Act (ACA). 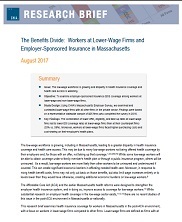 Since its inception, the Massachusetts Employer Survey has been the primary and most relied upon source of information on employer health insurance in the state.